Equnix Business Solutions (Equnix) is a Regional IT Solution Provider based on Open Source, primarily in Infrastructure Services such as: RDBMS PostgreSQL and Linux, World Class Customized Software Development, and Expert Consultant in System Optimization. Equnix design and architect state-of-the-art customized solutions (tailor made). Equnix Business Solutions is a trusted and customer-oriented IT Solutions Provider. Financial Services, Telco, Retails, and Industrial are our main respected Enterprise Clients in giving Open Source based Solution and World Class software development quality. We are an Open Source and Open Mind Company. Operating since 2007, Equnix adheres to its vision and mission. 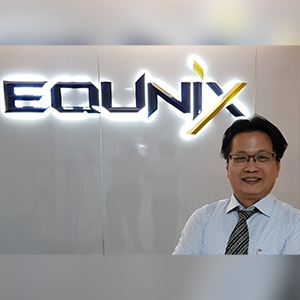 Equnix's vision is to become a leading IT Solution Provider for Enterprise Business class in the country and to strengthen South East Asian Country's autonomy for IT solutions avoiding vendor lock-in. The mission of Equnix, which provides a sophisticated, solid, and comprehensive IT solution, based on proven open source technology. In addition, it provides the development and customization of world-class IT solutions. The combination of the letters e and x at the beginning and end of the word Equnix reflects the company's philosophy of E xpertise, E xperience, and E xposure. These three things are the main pillars of open source IT solutions provider. Equnix is recognized as a PostgreSQL Professional Enterprise. Well known as #1 PostgreSQL Expert in ASEAN. Our expertise, experience, comprehensive knowledge, sharp analytical thinking delivers solution and hit to the heart of root cause of problem. Great software comes from mature design, implemented well proven and best practice solution from the Expert Software Architect. Great design of software should accommodate enterprise class quality: Reliability, Availability, Scalability. To date, Equnix has more than 60 large middle-scale enterprise clients and managed to save the country’s foreign exchange more than Rp 200 billion.